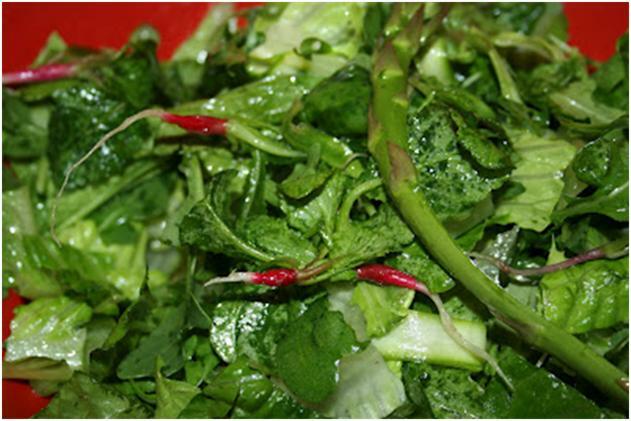 Thoroughly wash the radish greens in cold water to remove any dirt that may still be on them. Pat the greens dry and place them in a bowl with the lemon juice and olive oil. Toss to coat, sprinkle with salt and pepper, and allow them to wilt – about 5 to 10 minutes. Serve and enjoy. 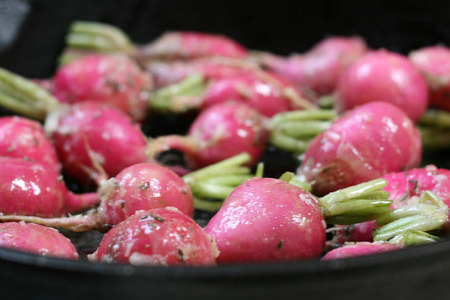 Preheat the oven to 425* F. Rinse the radishes to remove any dirt and pat dry. Line a baking sheet with foil and lightly grease with oil or cooking spray. Toss the radishes with the olive oil, thyme, salt and pepper and lay in an even layer on the baking sheet. Roast for 15 to 25 minutes until the radishes are tender but still slightly crunchy – this may take more or less time depending on the size of the radishes.